What if there were a monumental environmental threat that you didn’t even know was happening? What if you found out it is affecting your health and that of people you know and love? What if you knew it was such an enormous problem that it has the potential to destroy our crops and trees, the soil they are grown in, our entire water supply, and whole ecosystems – and that if you didn’t act, we could never turn back? We are not talking about fracking, nuclear energy, or the oil industry. We’re not even talking about climate change. What if it came into use in an insidious way, just as GMO foods have come into our food supply without our knowledge? What if it appeared to be harmless, but it wasn’t? And what if it were so cleverly woven into our culture that we didn’t even see it anymore? What if it were so masterfully stigmatized and wrapped in controversy that if you thought it strange or concerning, you’d be scorned or ignored? It sounds like science fiction, but it’s not. It’s happening right above you, and it’s called “geoengineering”. You can find articles and debates in which scientists are proposing to “dim” the sun to slow down climate change, using a technique called “Solar Radiation Management” (SRM). Their concept is to mimic the dimming and cooling effects of a volcanic eruption and existing particulate pollution made by human activity. However, it has been out of the proposal stage for quite some time, and even though officials will not admit it, SRM is already in full-scale operation. SRM sounds like a viable solution to slowing climate change, and scientists have repeated how “cheap” it is over and over again. But it comes with a price. In fact, it comes with many. Global climate engineering/geoengineering programs are radically disrupting weather patterns, disrupting the hydrological cycle (causing drought in some areas, flooding others), destroying the ozone layer, and contaminating the entire planet with the toxic fallout from these atmospheric spraying operations. Climate engineering programs have been fully deployed for many years. There is a mountain of hard science data and film footage to back up this statement of fact. If you’re concerned, take a few minutes to view the trailer to “Look Up”, a newly released, award winning documentary, narrated by William Baldwin. It is an excellent introduction to the issue of ongoing climate engineering / geoengineering. We have included articles and information that will shine more light on this extremely important issue, one that is radically affecting our planet’s life support systems, and every one of us. Our only goal is that you will review what we have included, and we hope it will motivate your continued investigation of the completely illegal, unregulated, and incredibly devastating climate modification programs that are being conducted on a global scale. 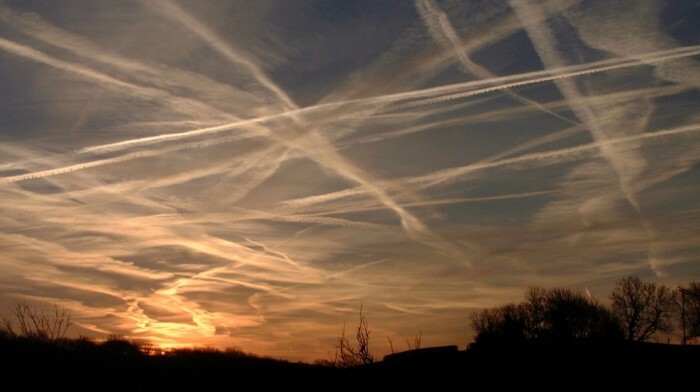 Still not convinced weather modification is taking place or has been used in the past? Please, forward this letter to everyone you know. WE ARE FAR BEYOND THE POINT WHERE WE CAN WORRY ABOUT WHAT PEOPLE THINK OF US. Our planet has no chance if we do not raise awareness and speak out. Dear Dane, Today is Feb. 27th, 2018 and I just wanted to post a few pictures taken on a daily basis up here in beautiful Lancaster, CA. I have been printing your flyers and posting them everywhere I go……bus stops, street corners, schools, libraries, even went into the local Sheriffs station and asked if I could post a couple of flyers on their information board and they let me! It is appalling and unbelievable how I see planes spraying every single day here. Sometimes 5 planes in the sky at one time. And I am constantly sick up here. I have asthma which has turned into C.O.P.D. and have been hospitalized 5 times within the past year…..pretty scary. But I will bust these bastards wide open. I am not scared of them. I know I live right above two KNOWN and DOCUMENTED D.U.M.B. 's (Deep Underground Military Bases) and Edwards Air Force base is 25 miles to the North where these planes seem to be coming and going. Have you put together a comparable letter for local meteorologists? I'm interested in creating an email list for all of the local news "weather people" in my market. Hello Del, about your question, though I don’t have a draft letter specifically directed at meteorologists, I engage in such exchanges almost every day. On that note, below is a response I drafted and sent out this evening to a major geneongineering denier/disinformation individual, a Mr. Ed Berry, perhaps you my find this of some help. Thank you for making your voice heard in this battle Del. Mr. Berry, certainly it comes as no surprise that you have parroted all the official denial narratives for the “chemtrail” term, right down to the exclusive use of that term while not once even mentioning a single science term (in your “debunking” message to this group) for the subject at hand (such as “geoengineering”, “climate engineering”. “stratospheric aerosol geoengineering”, “solar radiation management” (SRM), “cloud albedo enhancement” (CAI), etc, etc.) Waiving your credentials around as some sort of a license on reality and truth also holds no water whatsoever. You, like many other academicians, are always ready to repeat the official narrative of denial as we all know that is the only acceptable career decision for you. What happens when academicians are asked to deny the the climate engineering issue ON THE RECORD? Check the link below and you will see. Our legal team, The Legal Alliance to Stop Geoenigneering (LASG) conducted a survey of almost 1500 climate scientists and meteorologists, not one of them was willing to deny the geoenigneering reality on the record when the science terms were used. Next, I sincerely hope that everyone on this email list takes the time to at least open the link below and look at the NASA satellite images it contains. These images are smoking gun proof of massive atmospheric manipulation with atmospherically ionizing aerosols and radio frequency/microwave transmissions. About jets dispersing aerosols at altitude, though you will certainly deny any form of proof Ed, as that appears to be part of your job description, I can only hope the rest of the individuals on this list examine the two very short videos below (2 minutes each) and make up their own minds with their on sense of reason and logic. as this geoengineering is a global disaster, my question is: are most, if not all, countries of the world part of this via their commercial airlines participation in the spraying or is this a "western" ( US + Nato ) military kind of operation? I am extremely grateful for your extremely valuable work. Hello Werner, yes, there is extensive cooperation between nations, even nations that are otherwise in conflict with each other. As being just one of the hundreds who comment here, where does one start voicing their serious concerns over what's happening to this planet and not cover what has already been commented on? I have watched these Chemtrails being sprayed for quite a number of years now and living in Central California for 70 years I really notice a huge change in the way the sky looks with cloud (?) formations and how the weather has changed and everything that comes with it. I have to mention that looking on Vimeo and Wikipedia I constantly see these Chemtrails in videos and pictures all across the earth. Quite alarming to say the least. Reading other comments I see I'm not alone viewing this madness right from my own back door. It's getting to the point that I very seldom look forward to opening up our back window blinds first thing in the morning to see what the new day brings. I honestly see no end in sight for the destruction of this planet. Seeing what Fukashima is still bringing, the Deep Horizon oil spill in the Gulf of Mexico is still ruining deep water currents, the Pacific Gyre and this Fracking going on and this only names a few of my concerns. Oh, and then I have to add what's happening to our country, at all levels that will effect all countries, things aren't looking too well. Are there any petitions circulating on the internet to try and demand a response from our elected officials? Thank you so much for bringing this issue to my attention, and thank you so much for the resources. It’s a great tool kit and I for one will be making copies of the flyers and handing them out to people I know. I am also going to suggest to them to make copies and hand out to others they know. I think this is a simple, yet effective method to get the word out and not burden anyone with too much work. I think with awareness something can be done. I’d like to know if there is some site or link withing a site that tells of a correlation to when we see massive chem trails and when there is a weather change. I think I heard it’s 2 days ahead. There were massive chem trails in my area today and they predict rain in 2 days so I wonder if this shows the correlation. your site is awesome in its information! Just so you know I was at a teaparty meeting a couple years back and they had a speaker from Wright Patterson Air Force Base. I asked him about chem trails and he had enough nerve to say there was no truth to them! I on the other hand did not believe him and always wandered if he wasn’t a plant there just to find out what was going on. Anyway I have since been trying to get the word out and some people look at me as if I had sprouted horns. My question is will you have more flyers for sell? I really like the one that has a picture of the before and after of the skies and Would you consent to this? FLYER! And its got your website on it so people will know to go there. Some times people think twice when the facts are before them. You know the old saying,seeing is believing! Please can you e-mail me if you get the flyers back in? Thanks and keep up the good work!